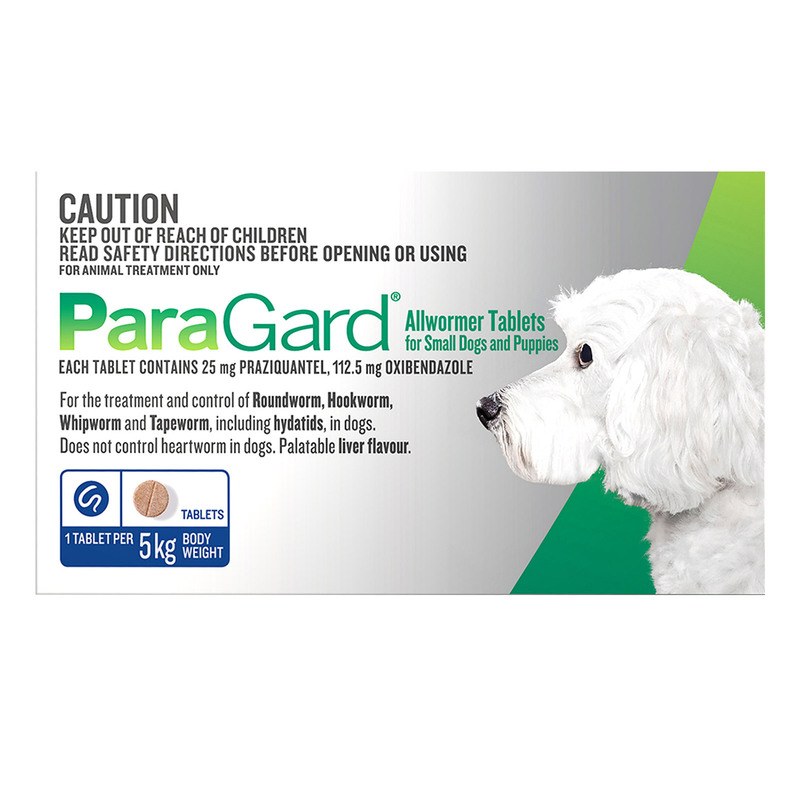 Paragard Broad Spectrum wormer for dogs is an effective oral treatment that treats and controls major types of intestinal worms in dogs. A single tablet eliminates roundworms, hookworms, whipworms and tapeworms (including Hydatid). 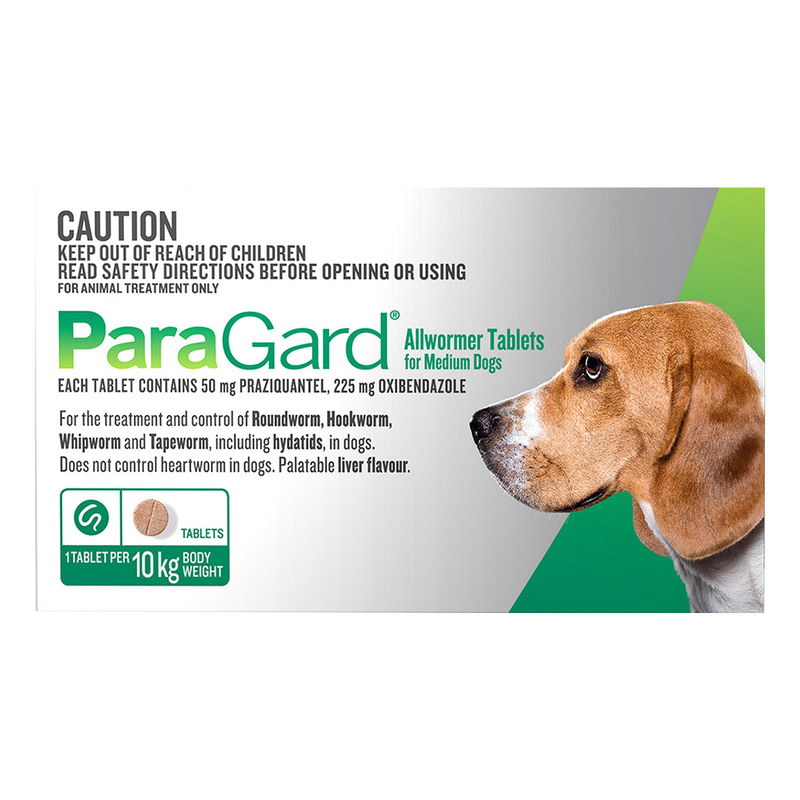 The easy to administer tablets save the pet from secondary diseases caused by these worms. 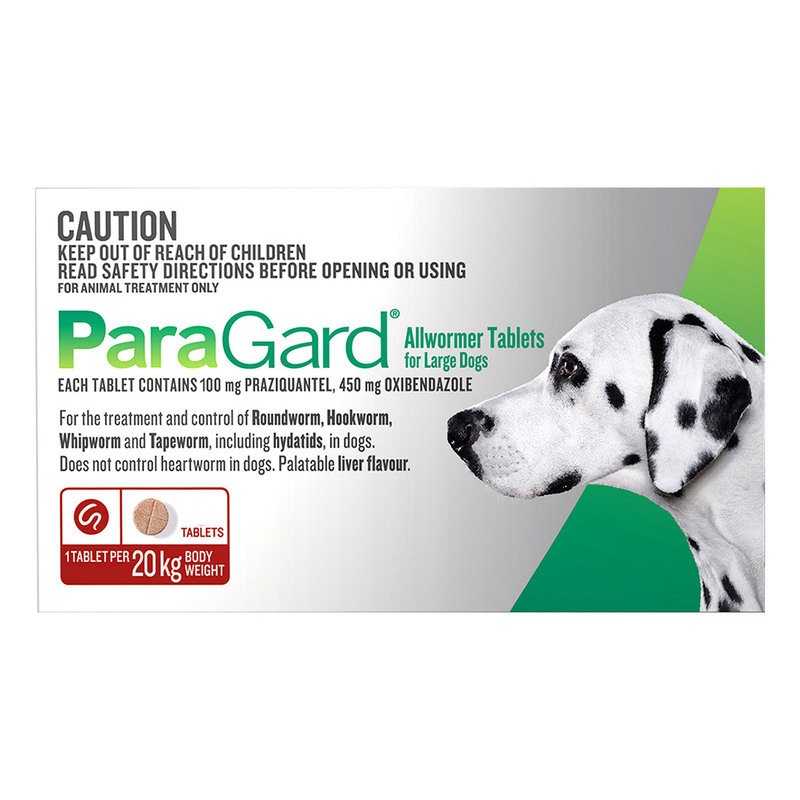 Praziquantel, Pyrantel and Oxantel are the active ingredients of Paragard tablets for dogs. The combined effect of these ingredients destroys all kinds of gastrointestinal worms in dogs. Praziquantel has anthelmintic property that kills flatworms including all types of tapeworms. Pyrantel eliminates roundworms and hookworms while Oxantel Embonate treats and controls whipworms. 1 tablet for 20 Kg bodyweight. It is administered as per the weight of the pet and the dosage varies with the weight. Weigh your pet and choose the relevant pack. For administration, give relevant dosage of the tablet at 2, 4, 6, 8 and 12 weeks of age. Repeat at every 3 months. Give the tablet directly in the pet’s mouth. If the pet resists then crush and mix with the pet’s food. Fasting before the ingestion of the tablet is not necessary. For further details, consult a Vet. It can be combined with other treatments like flea and tick treatments, heartworm preventive without any issues. Removes worms within a day. Worked well on my dog. She had heavy tapeworm infection which is now completely cured. Infact, it has been 3 weeks already and she seems perfectly fine now. No itching or scooting anymore. This oral tablet is highly effective against intestinal worms. It is very easy to administer and my furry pal takes it without any problem. Thank you so much!!! My doggy was suffering from intestinal worms and one of my friends suggested me to try this treatment. I researched on Google and found that Vet Supply provides this product at an economical price. I bought this product and received it in a week's time from the date of order. I am amazed to see its effect on my furry pal. Thanks to you guys now my pooch is free from the disgusting worms. I will definitely buy more dog supplies from this great shopping destination in future.